The Best Triceps Building Tips And Workouts! The triceps are a muscle which are sometimes forgotten when looking to build massive arms. Get some great ideas and tips here for building up your triceps. How many people here like to play horseshoes? Ok, well, not that many... How many people would rather have a huge horseshoe on the back of their arms? Now we're talking! The triceps are a muscle which can sometimes be relatively forgotten when looking to build up some massive arms. Too many people want bulging biceps, but in reality, the biceps are a smaller muscle group compared to the triceps. There are many things you can use to build your triceps including dumbbells, cables, barbells, and even your own bodyweight. The best thing you can do is try out as many exercises as you can and see what specifically works for you. Let's first learn a little bit about the triceps, however, before we get into the tips and workouts. The Triceps Brachii has three heads which connect the humerus and scapula bones to the forearm bone called the ulna. These three heads are known as the Lateral, Medial, and Long heads. The lateral head is located on the outward facing side of the humerus. This head is most responsible for the horseshoe shape of the triceps. For More Triceps Anatomical Information, Click Here. 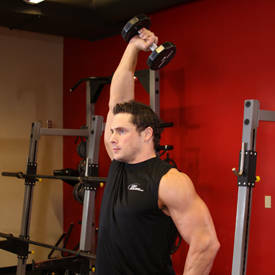 The primary function of the triceps is to extend the elbow (straightening the arm). The secondary function of the triceps is fulfilled only by the long head of the muscle, which brings the arm down towards the body (adduction). This basic movement stresses the entire triceps muscle complex, particularly the outer and medial heads. Grip the bar overhand with your index fingers no more than 3-5 inches apart in the middle of the handle. Your feet should be shoulder width apart, about 10-12 inches back from the handle. 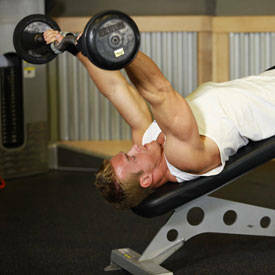 Fully bend your arms, pressing your upper arms against your torso, where they should stay through the duration of the set. Leaning slightly forward, move your forearms down, slowly straightening your arms. Hold the straight-arm position momentarily, while flexing your triceps intensely. Slowly return to the starting point. A good variation is the rope handle. 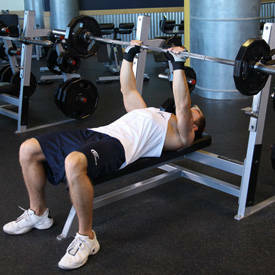 You can also do this exercise with an undergrip on the bar and with different width grips. These fundamental favorites isolate intense stress on the triceps, particularly the medial and outer heads. 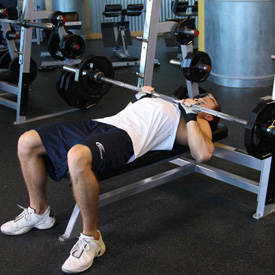 Taking a narrow overgrip in the middle of a moderately weighted barbell, lie on your back on an exercise bench. Keep your feet on the sides of the bench to provide balance. Extend your arms straight up above your head. With your upper arms remaining motionless throughout the set, bend your elbows allowing the barbell to travel downward in a semicircular arc until it slightly touches your forehead. Reverse the direction of the movement of the bar using only triceps strength to slowly straighten your arms. There are many effective variations, such as using different grip widths, doing them seated, using an undergrip, or using a decline or incline bench. This movement stresses the entire triceps muscle complex, particularly the inner and medial heads. Take the dumbbell and grip it so that your palms are facing the inner-top plate and the dumbbell is hanging straight down (perpendicular to the gym floor). To keep the weight from slipping, encircle your thumbs around the dumbbell handle. Lift the dumbbell straight up above your head. This is the start position. Lower the weight slowly behind your head until your arms are full bent. Without bouncing in the bottom position, slowly raise the dumbbell back to the start position. You can increase the strictness of this movement by sitting at the end of a flat exercise bench, or on the floor with your back braced against the bench. This is a fundamental triceps exercise, stressing the inner and medial heads of the triceps muscle complex. Take a narrow overgrip in the middle of a moderately-weighted barbell. With feet about shoulder width apart, stand erect, and extend your arms straight up from your shoulders. Keep your upper arms in the same position, while you lower the weight slowly behind your head until your arms are completely bent. 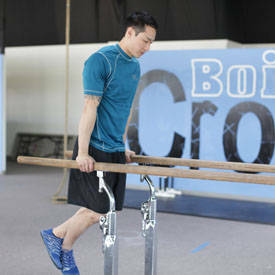 Without bouncing in the bottom position, slowly raise the bar back to the start position. You can vary the width of your grip on the bar or use an undergrip to isolate different parts of the muscle. You can also do these seated to isolate your legs from movement, making the exercise somewhat stricter. Train triceps on their own day, or pair them with a small muscle like biceps instead of a larger muscle like chest. Prioritize your tricep development by working them first when you're fresh and strong. Compound movements build the most mass. Weighted dips and close-grip bench presses are my favorites for building monstrous triceps. Exercise order is important. Perform your compound movements at the beginning of your routine so you can use maximum weight to blast your triceps. Then, to build quality and shape and to isolate the muscle, perform single joint movements like skull crushers, pressdowns, and dumbbell extensions to enhance your triceps development. Progressive resistance: perform more repetitions with the same weight or increase the amount of weight you use each week. Remember, big muscles move big weight. Use the correct weight that forces your muscles to fail within the appropriate rep range. 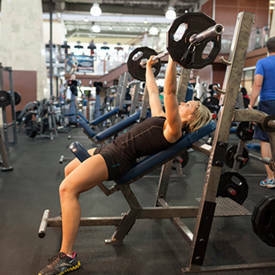 Rest 2-3 minutes between each set so you can continue to use the heaviest weights. for each set, each exercise. I don't believe in gaining muscle and losing fat at the same time. You're either bulking or cutting. But in my opinion, the treadmill is the best machine to help you lose fat. Intense (hard) and quick (30 min.) - this helps you spend more calories and keeps your metabolic rate up for a longer period of time, thus, burning even more calories." "FarEastBeast" says, "CGBP - Mass builder. IMO (in my opinion), the best. Stresses all three heads, maximal loads, excellent peak contraction. Side benefits to chest (particularly inner chest, and front deltoids). Straight or v-bar are the best for mass as you can go heavy on them. These emphasize the outer head. Ropes and reverse grip are okay, but force you to use less weight. Good for outer and medial heads, IMO good for a shock once in a while, but difficult to go heavy on and maintain good form, thus not so great for mass. EZ or straight bar these are all the same exercise, IMO the best isolation movement for triceps. Good for inner and medial heads. Done correctly these offer excellent isolation and a great peak contraction under heavy loads. As with CGBP, these will nail all three heads, as well as the pecs and front delts. You must stay upright to avoid using too much chest, and this makes it a difficult exercise to master IMO. But well worth mastering. I'm still working on it. inner and medial heads. These are good for mass also, though personally I have trouble getting a good peak contraction on these, so I largely avoid them. These are a favorite of mine so I'm adding them. I do them from a high pulley, leaning forward with my elbows just above my head and extend straight out and upward. This angle gives me better leverage with the ropes so I can go heavy and get excellent contractions." "To sum it up, the more angles, the more mass! This rule holds true, not just for the triceps, but all the muscle groups in your body." "Studies have also proved this. One such study done on the upper body found that 12 weeks of triceps training which people have typically felt to be middle portion exercises, produced significant growth in the middle portion of the muscle with virtually no change anywhere else." "For example, the lateral and medial heads of the triceps are stressed most by press-downs and kickback movements, while arms-overhead movements will slightly favor development of the long head."